The original itinerary to the cruise-that-didn't-happen included an excursion to Stirling Castle, which is about an hour by train from Edinburgh. The castle wasn't my primary goal. I wanted to see the set of seven recently completed tapestries that now hang in the Queen’s Inner Hall in the Royal Palace. I appreciate tapestries much as I appreciate any great art. I've tried my hand and have woven tapestries, but I'm no tapestry weaver. There is a difference. A big difference. The Stirling Castle project is part of a master plan to furnish the castle as it would have been in the 16th century. 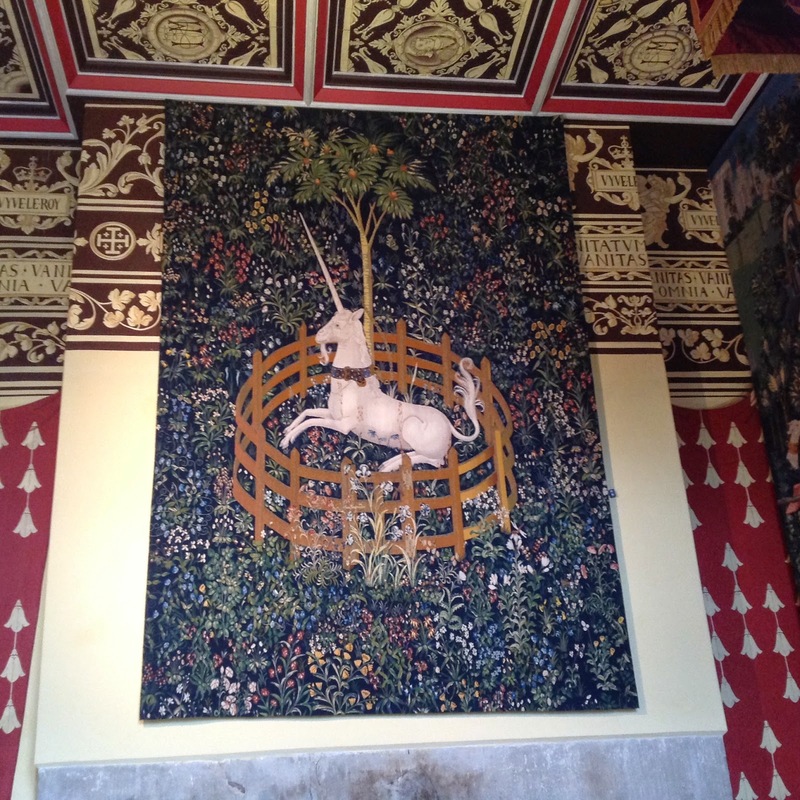 Two inventories of goods--1539 and 1561--list two sets of "unicorne" tapestries belonging to James V of Scotland. After 1578, when the inventory lists only four pieces, the tapestries disappear from recorded history. 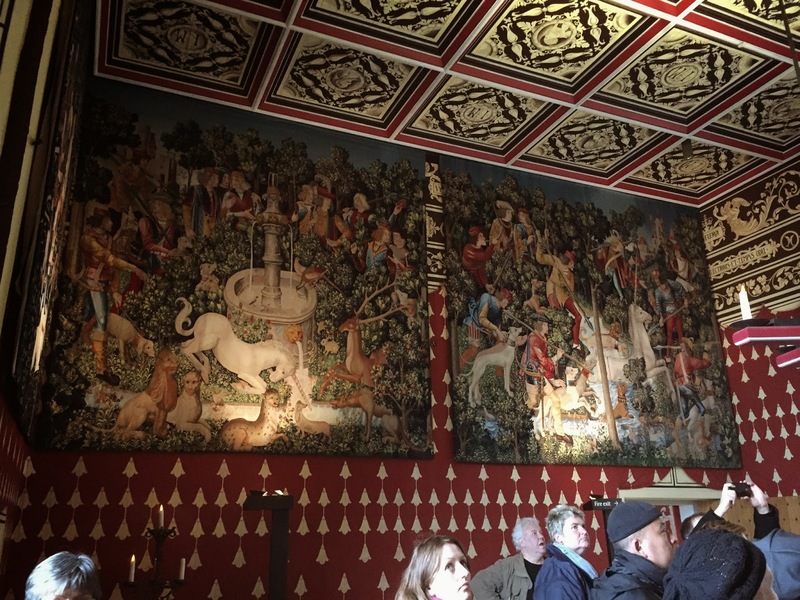 The Stirling Castle tapestry project, which was commissioned by Historic Scotland and managed by West Dean College in West Sussex, tapped the college's West Dean Tapestry Studio and its master weavers. 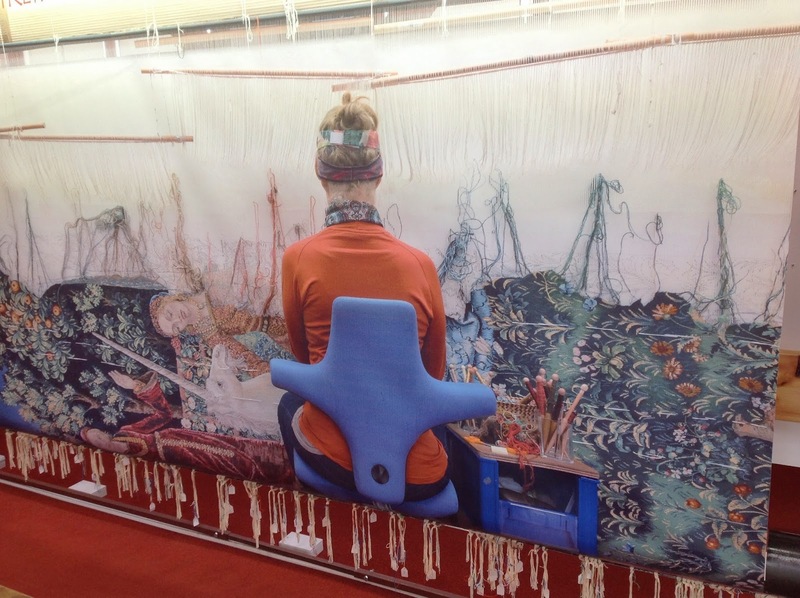 One of only a handful of remaining tapestry studios worldwide, the Studio specializes in using heritage techniques in contemporary design. 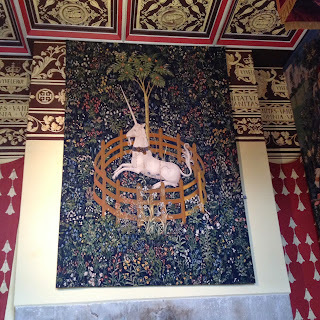 I know of two remaining sets of unicorn tapestries--in Paris (Musée de Cluny) and in New York at the Cloisters Museum of the Metropolitan Museum of Art (Met). Both are stunning and well worth a visit. The project's leaders considered the Met's "Hunt of the Unicorn," ca. 1495 to 1505, "one of the most majestic surviving sets" and developed a collaborative working relationship with that museum to research medieval techniques, materials and colors. The project launched in 2001 and two teams of three or four weavers began work in 2002. They wove in concurrently over 13 years. Nearly 20 weavers from Scotland, England, United States, Canada, Japan and Australia worked on the project, which was guided by West Dean's Master Weavers. The college-based team in the south of England completed the first three tapestries. The remaining four were woven in a purpose-built studio in the castle's Nether Bailey. "akin to walking in virgin show with one track running through it. You set out not wanting to break into another path however stepping into another's footprints is quite hard. You need to tread your own path as best you can; eventually you find the confidence to break free and find your own route." Materials. The tapestries are 90 percent wool with gold metallic threads and mercerized cotton also used in the weft. The warp is cotton. 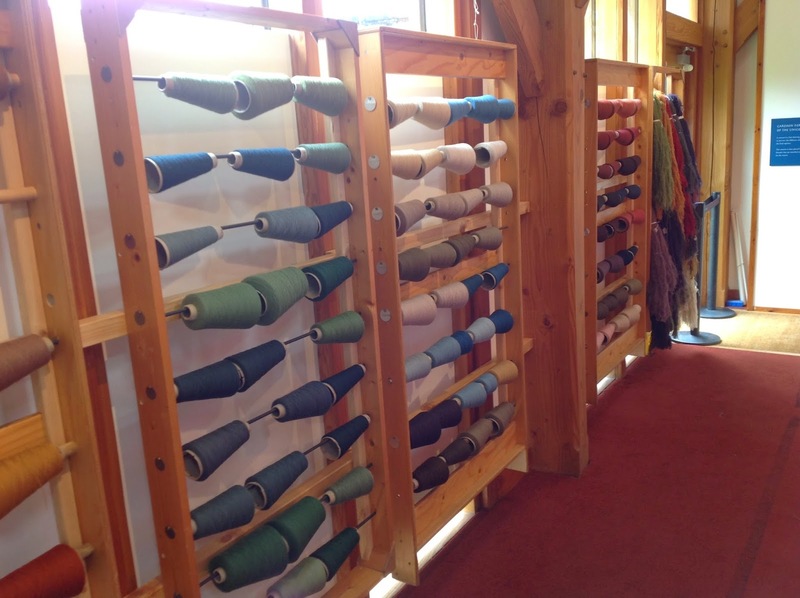 All the yarn was specially dyed at West Dean. Techniques. Using 16th century weaving techniques, the weavers used hatching, hachures, demi-duite, and slits--techniques not commonly used in current tapestry weaving. Like the originals, the tapestries were woven sideways. 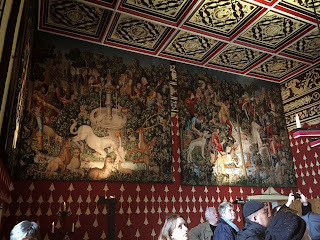 Although the looms, tools, and most of the weaving materials and techniques were the same as those used in the 16th century, there are some differences between the Cloister tapestries and those woven for Stirling Castle. Warp ends per centimeter (epc). The Cloister tapestries have about seven epc. The project's tapestries are warped at four epc. Weft. The project substituted mercerized cotton, which is more durable and preserves its color better than the silk used in the Cloister tapestries. Color palette. 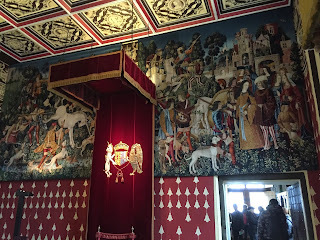 The wool yarn was dyed using modern chemical dyes, whereas the yarns used in the historic tapestries would have been dyed with natural dyes from plants, invertebrates, or minerals. Weavers wove facing the front of the tapestry, rather than from the back as in traditional Gobelin weaving. 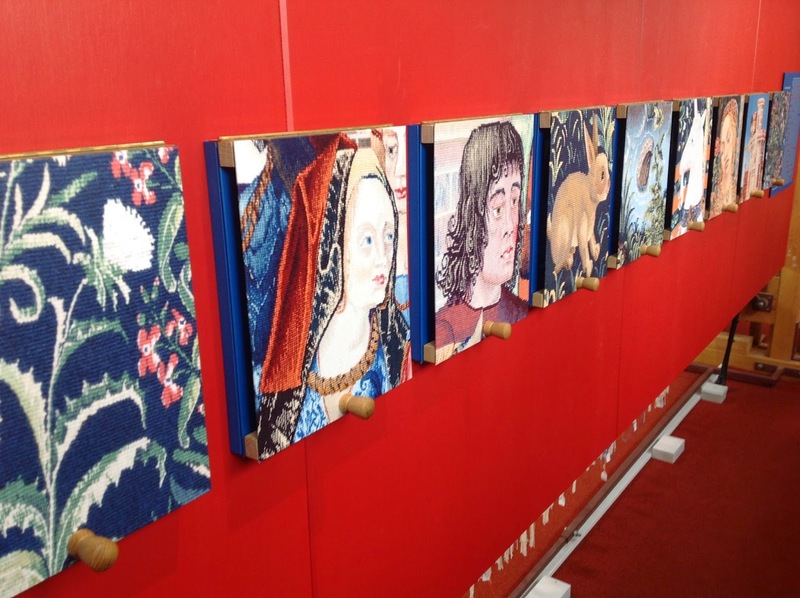 This completed project is quite remarkable and well worth a trip to see the tapestries hung as they would have been. But if travel to Scotland is outside your plans, Stirling Castle and the West Dean Tapestry Studio have a wealth of information about the history, the techniques, and the weavers on their web sites.